102 min. Janus Films. Director: Kirsten Johnson. Cast: Kirsten Johnson. "A life in pictures." It's a cultural term of art to which we've become accustomed, especially in the context of photo books (say, Hemingway: A Life in Pictures) and documentary films, especially—and punnily—those about photographers and filmmakers themselves (Stanley Kubrick: A Life in Pictures). The documentary film Cameraperson could well have been named "A Life in Pictures," for it fits both uses of the phrase. As a record of the career of documentary cinematographer Kirsten Johnson, it is the story of a life spent "in pictures" (images and films), but it is also about the sometimes noble, often mercenary, Sisyphean challenge of attempting to encapsulate life experience or, indeed, specific lives in a series of pictures no longer than a feature film. Johnson's film, a mid-career culmination of her experience, is a found-footage montage seeking to, in her words, reveal "how stories are constructed...convey the immediacy that comes with finding oneself in new territory with a camera, as well as to give the audience a sense of how the joys and dilemmas a cameraperson must juggle accumulate over time." Forty-four segments attest to twenty-four separate projects for which Johnson operated the camera, along with some personal home movies. Some of the films to which Johnson has contributed photography are quite prominent, as documentaries go (Citizenfour, Fahrenheit 9/11, Derrida, Happy Valley, Audrie & Daisy, Pray the Devil Back to Hell, Darfur Now), others less so. But the footage Johnson and her editors assemble here cuts straight to the subjectivity of her own experience, what she chose to see through her camera's eye and what she felt in the process and, at times, the aftermath of each filming experience. Johnson eschews narration, presenting the footage raw but in a sequence of cumulative power. At times, the shots testify to environment, natural beauty, and the essence of unique life within unique spaces and cultures. More often, though, Cameraperson is a film about personality (Johnson's own and that of her subjects) and empathy. The film begins with material from 2011's Women, War & Peace: "I Came to Testify," a PBS segment shot in Bosnia and Herzegovina with a focus on female survivors of war. Johnson forged a connection with her subjects that led her, and Cameraperson, to return to the village where she shot and the families she recorded, sharing with them the fruits of her labor and the bread they offer to break with her. Cameraperson often throbs with Johnson's desire to be a person when she must be, first, a cameraperson, as when an Afghan boy becomes emotional recalling a traumatic injury or when a Bosnian boy recklessly plays with an ax near a toddling sibling. Cameraperson does include some "magic" moments that any cameraperson would beam to have captured (one of the most striking catches a nervous breakdown chased by a mini-avalanche), and a couple of bits (those involving philosopher Jacques Derrida and Michael Moore) feel squeezed in almost out of a duty to include "celebrity" cameos (well, brushes with fame are also part of the job). More often, though,m Johnson highlights moments that depict or elicit quiet contemplation. Some of these very explicitly constitute memoir: a glimpse of Johnson's nine-year-old mind in a handwritten poem, time spent with her children and their grandfather, and most wrenchingly, conflicted scenes of Johnson recording for horrible-beautiful posterity her Alzheimer's-afflicted mother in that all-too-familiar nether-world of decline, confusion, childlike wonder, and increasingly precious flashes of clarity. Above all, Cameraperson is about Johnson's view of her work as a vocation of sharing, and she's smart enough to make implications but let us draw our own conclusions about what these images, individually and collectively—and the art form to which they belong—mean to their photographer, to us, and to human society. 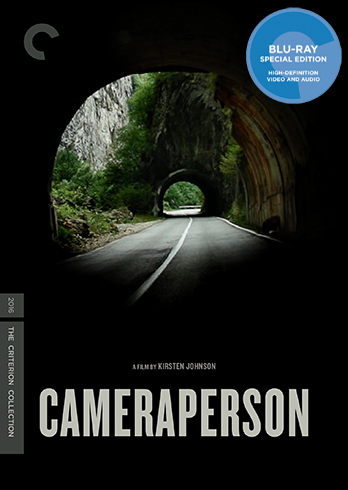 Criterion introduces us to Cameraperson, making its Blu-ray debut, in a fine special edition with impeccable A/V specs and several significant bonus features. By the film's essential nature, the picture quality varies as it moves from source to source, but by devoting a mighty high bitrate to the feature, Criterion helps us to rest assured that the HD transfer positively maximizes the material. Indeed, the picture quality often conjures the beautiful (after all, it is a film, in large part, about cinematography)—with especially eye-catching color—and invariably, sharply conjures the truth of life in a variety of rural and urban settings. Audio quality obviously varies, as well, given the many productions from which Cameraperson culls footage, but if the DTS-HD Master Audio 5.1 soundtrack at times sounds a touch raw, that's part and parcel of its documentary authenticity, and the general impression is of cleanliness and clarity of audio matched to its counterpart visual. Bonus features include the featurette "Editing Cameraperson" (36:32, HD) with director Kirsten Johnson, producers Marilyn Ness and Danielle Varga, and editors Nels Bangerter and Amanda Laws; the roundtable discussion "In the Service of the Film" (39:06, HD) with Johnson, producer Gini Reticker, and sound recordists Wellington Bowler and Judy Karp; excerpts from two 2016 film festival talks with Johnson, including one between her and filmmaker Michael Moore: "The Traverse" (21:48, HD) and "Sarajevo Film Festival" (14:52, HD); Johnson's 2015 short film "The Above" (8:35, HD), and the film's "Trailer" (2:05, HD). The package includes the customary Criterion booklet with tech specs, photos and screenshots, and liner notes, here including an essay by filmmaker Michael Almereyda ("Cameraperson: Getting Close"), and reprinted writings by Johnson. All site content © 2000-2019 Peter Canavese. Page generated at 04/17/2019 05:02:55PM.